What role has the Blessed Mother (the model for all motherhood, and especially spiritual motherhood) played in your faith journey? Great question! Our Lady, besides being the model for all motherhood, is also the first and most excellent consecrated virgin in the Church. Besides all the good that I have gained from her example and intercession, I’m sure that Mary’s maternal love and concern has helped my vocation even in ways of which I’m not aware. Growing up in a Catholic household, I was taught very early on to think of Mary as my mother, and this really stuck! (I even have memories of expressing my love to my earthly mom by telling her that she was second-best mother in the world, because of course it was Mary who was the “first-best!”) So when I was a child, I always had the sense that I had a special friend and protectress in Heaven. I’m sure that this helped foster my vocation, even though I can’t quite describe the exact cause-and-effect dynamic. While for the most part I have retained this warm personal affection for Our Lady, as I grow older I tend to see her in a somewhat more objective manner. That is, I relate to her more and more as the exemplar of what I am supposed to become spiritually. At the Annunciation, I see her “fiat” as an example of the courage and trust in God—as well as the humility and greatness of heart—which I am also called to have as a spouse of Christ. In the Wedding at Cana, I am reminded of the loving confidence with which I can approach Our Lord. (And in this I also recall how important it is to “do whatever He tells you!”) At the crucifixion, I come to a greater awareness of how painful, but also how very important, it is to stay with Jesus in His darkest hours. And at Pentecost, I gain clarity about my place in the Church as a consecrated woman; because even though Mary was not called to be an apostle, her being at present at Pentecost indicates that she nevertheless played a vital part in the life and founding of the fledgling Church. At this particular point in my life, I find that I am particularly drawn to Mary’s role as the “Theotokos” (Θεοτοκος), or “God-bearer” (i.e., the Mother of God). This is one of Our Lady’s oldest titles, and I think also one of the most meaningful. 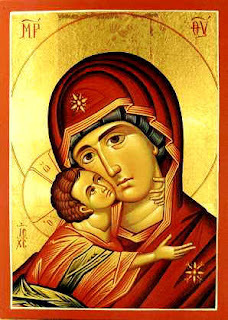 While Mary physically carried and give birth to the incarnate Son of God, I find that this image of Mary is the one that most easily relates to the concept of spiritual motherhood. Biological miracles notwithstanding, Mary was able to become the Mother of God because her soul was open to receiving the Word, and she allowed it to become fruitful in her person. Similarly, although my efforts to welcome the Holy Spirit will never lead to my giving birth to an infant, God’s action in my soul can still become fruitful. Thus, I can still “bear God” to the people around me. And while this is a mysterious concept, I do believe that through grace, my prayer can still bring life to souls.